SSI is recognized by the National Minority Supplier Development Council (NMSDC) as a certified Minority Business Enterprise (MBE). 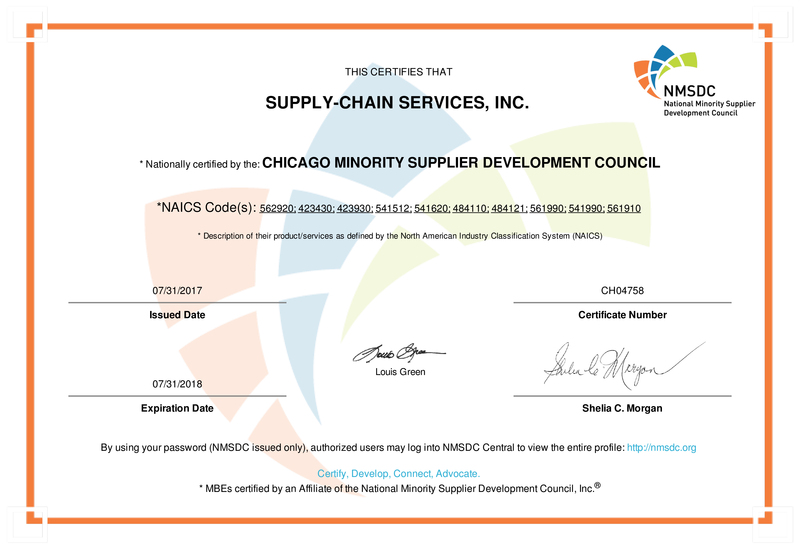 NMSDC’s Chicago Chapter, Chicago Minority Supplier Development Council, issued the certification. NMSDC is one of the country’s leading corporate membership organizations, committed to helping solve the growing need for supplier diversity. NMSDC matches its more than 12,000 certified minority-owned businesses to it network of corporate members who wish to purchase their products, services and solutions. Its corporate membership includes many of the largest public and privately-owned companies, as well healthcare companies, colleges and universities. NMSDC has an unwavering commitment to advance Asian, Black, Hispanic and Native American suppliers in a globalized corporate supply chain.